On Monday we posted our how-to for making your very own Office Burger. And as I mentioned, it certainly will not be putting Father’s Office out of business any time soon but it will be a great addition to your next barbecue and possibly impress your food-loving friends. 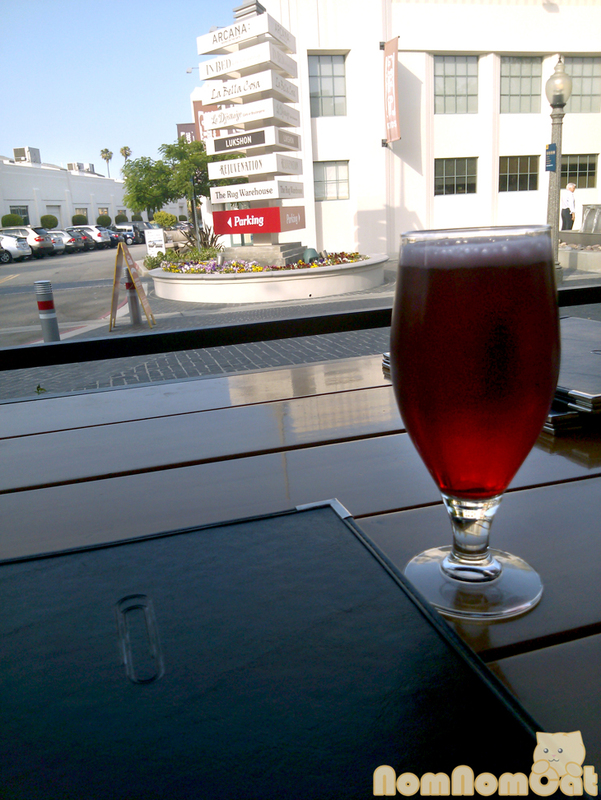 But I’ll be honest – we did not quite give Sang Yoon’s gift to the LA gastropub scene the proper introduction. The Best Burger in LA is a prestigious title with gourmet burger joints popping up left and right. The Office Burger takes the lead on many of these lists, and rightly so — it’s delicious! A brief introduction to Father’s Office. It’s hard to say if Sang Yoon could forsee just how big of an impact his decision to install a small kitchen in the back of the (first and original) Santa Monica location on Montana would have, but it transformed F.O. from a dime-a-dozen dive bar to one of LA’s most popular watering holes and arguably revolutionized the bar food scene in the US. Sang Yoon went on to open a second F.O. in Culver City’s Helms Bakery District, once home to an actual bakery that would deliver bread to local residents like the milk man and his glass bottles on neighborhood doorsteps. This location is newer, larger, offers ample (for LA) parking, and frankly, it’s closer to where we live so this where you’ll likely find us. Let’s start with the “-pub” in gastropub. F.O. 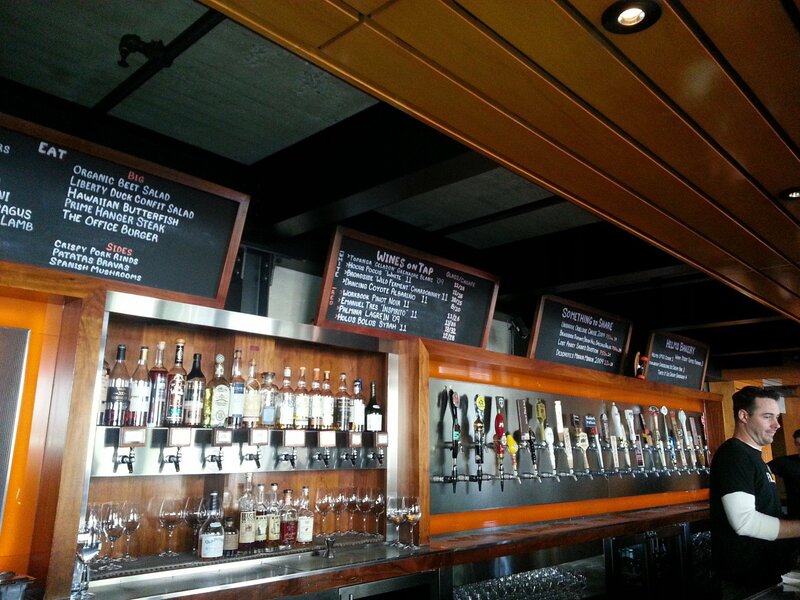 features 36 craft beers on tap, ranging from local microbreweries to imported genuine Belgians and more. I think this is the only place that served my favorite Lindemans sweet Belgian lambics on tap, switching from the peche lambic to the framboise and back. Their selection rotates with the seasons but variety is the constant. (Now their resident fruity brew is the Liefmans Fruitesse.) Martin knows his beers better than I and typically partakes in German hefeweizen or Belgian witbier, among his usuals being the Allagash White from Maine. Not sure what to order? Never even heard of these breweries? Just ask the guys and gals behind the counter – they know their stuff and can help you find something you like. They’re like… beer sommeliers, if you will. On to the appetizers (or appeteasers… Big Bang Theory anyone?). Though let me say now that the burger is definitely a must-have, there are some noteworthy Small Plates on their menu that you’ll want to check out, especially if you’re hanging out in a group and can share. 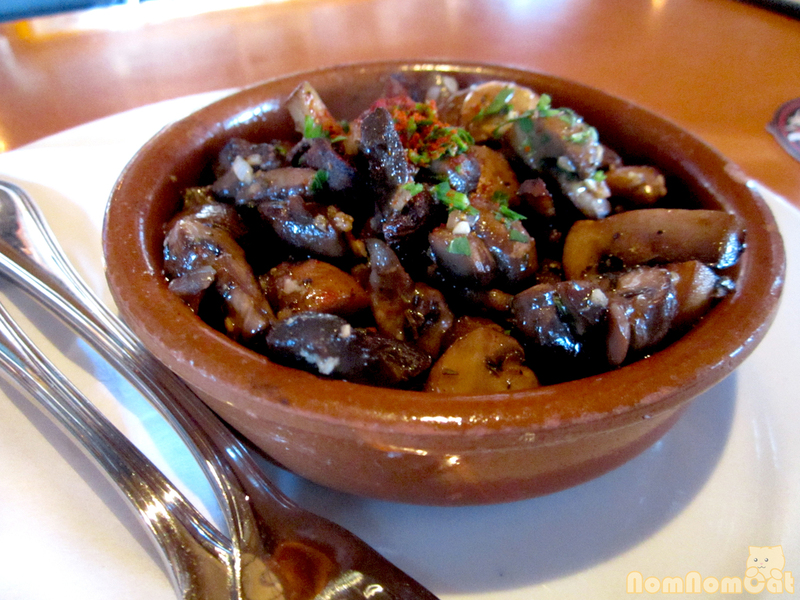 First, the tried and true – Spanish tapas style mushrooms, served warm and dressed in garlic thyme, sherry vinegar, and olive oil. Delicious moist little flavor bombs, I found myself picking up my fork over and over to spear yet another unsuspecting mushroom despite trying to save my appetite for the burger. 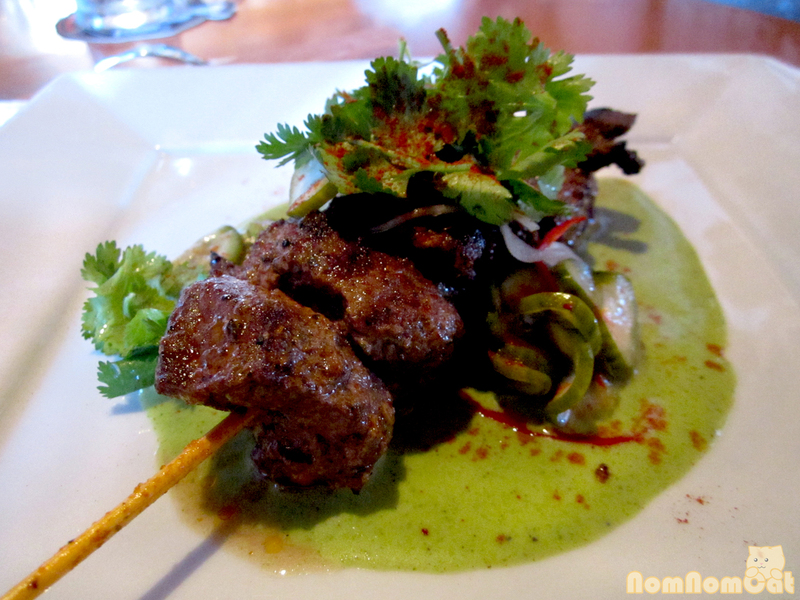 The show-stopper – Sonoma lamb skewer. The presentation of the kabob over the stunning green yogurt sauce definitely caught the attention of everyone at our table. The spiced meat was flavorful though sadly a bit dry the last time we had it. The unique – Fresh Sea Urchin Crostini. Don’t forget to check out the LED monitors at each cash register; they often have a small list of daily specials. If you spot the uni crostini, GET IT. 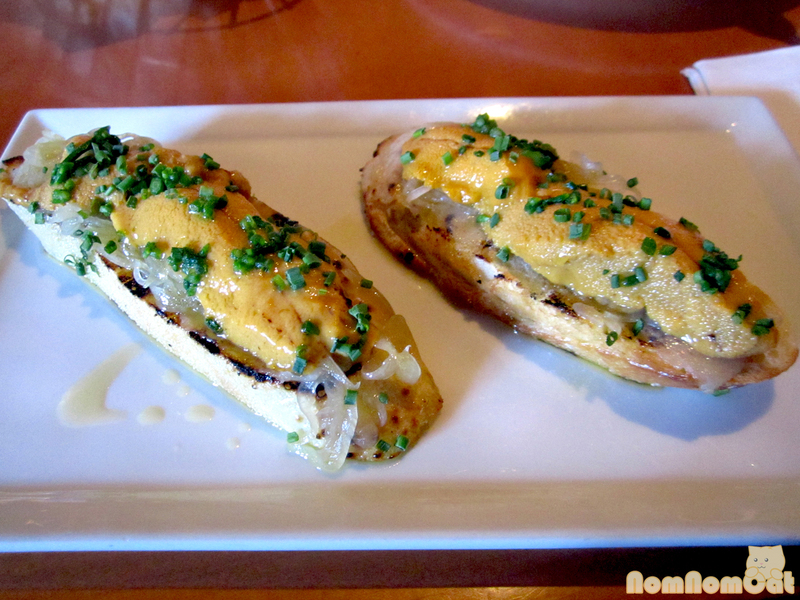 Grilled slices of baguette topped with sauteed fennel and generous pieces of fresh uni, probably locally sourced from Santa Barbara. Hot and cold, crispy and creamy, this juxtaposition of flavors initially confused me, then intrigued me, and finally, it won me over and delighted me. And now I crave it but sadly, it has gone under the radar… for now. Torture, I know, but before we talk about the burger, let’s briefly go over the sides. 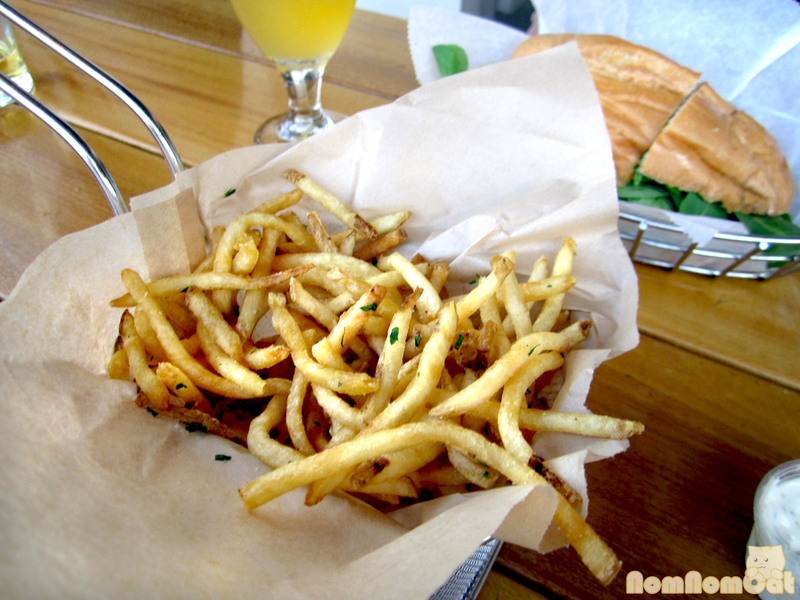 Our favorite are the regular ol’ frites. 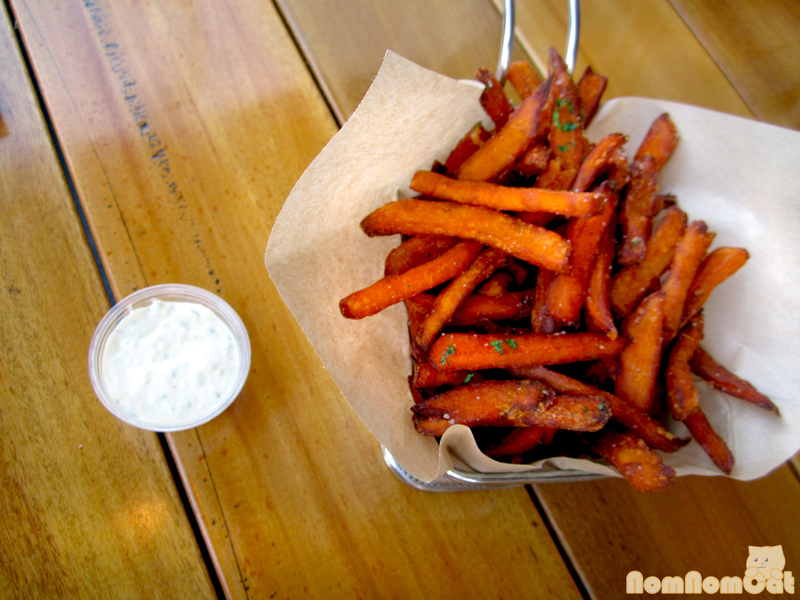 You can add them to your burger basket for a $2.50 charge, or for $5 you can spring for a whole basket. We opted for the latter because we just can’t get enough of these crunchy, thin shoestring fries tossed in salt and parsley, paired with an addictive garlic aioli. Some people say the frites are too thin, but Martin and I are the type to dig all the way to the bottom of a French fry carton to find the extra crispy teeny-tiny bits. These are perfect. Okay, okay, now for the burger. The infamous Office Burger. The patty – dry-aged ground chuck, juicy and charbroiled to the perfect temperature (the one thing that can vary on their notorious no-substitutions menu). This isn’t your ordinary backyard barbecue, slather it with ketchup and relish sort of burger (although I adore ketchup and relish). 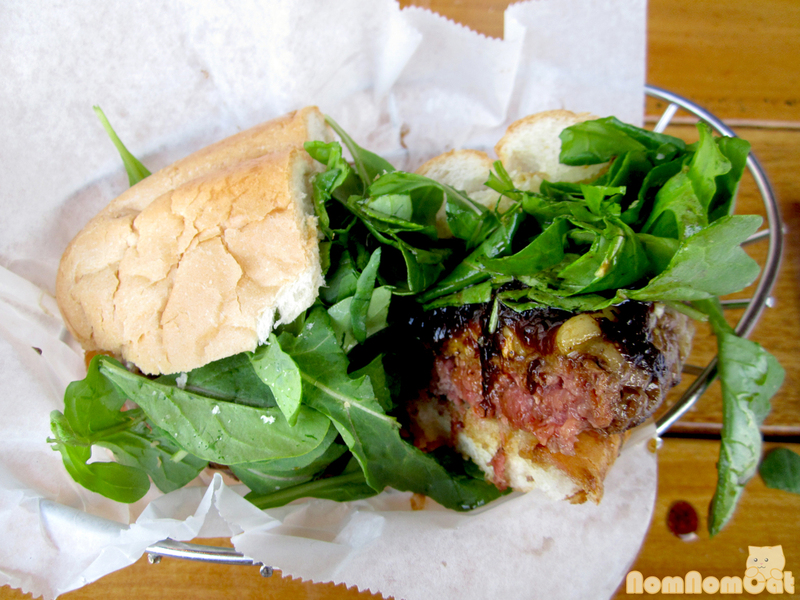 No, this gourmet burger is topped with Maytag bleu and gruyere cheeses, caramelized onion & applewood bacon jam, and a mound of arugula, all sandwiched on a toasted French roll. A-MAY-ZING. 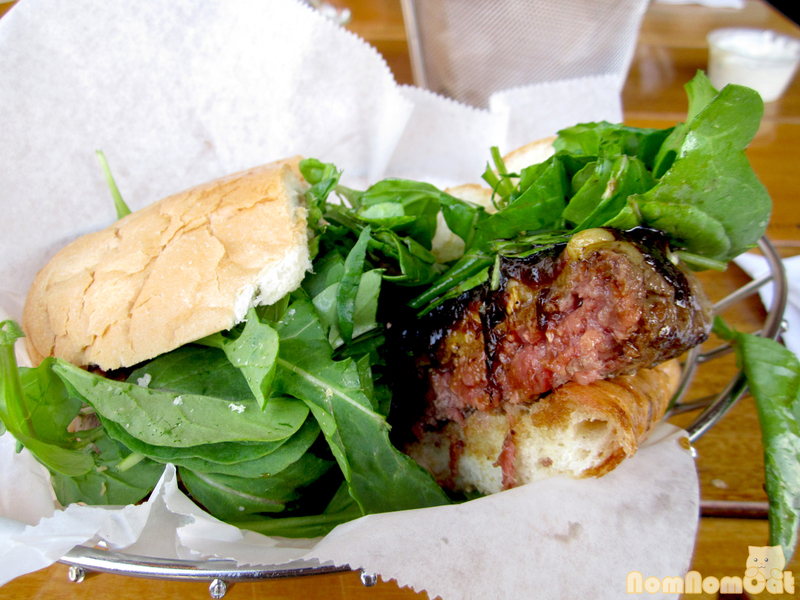 Each satisfying bite tantalizes the taste buds with the sweet, sweet onions, the rich meat, the sharp cheese, and slight spice of the arugula… This burger is full of flavor and decadence. I was so excited when Father’s Office added desserts to their menu. Back in 2011, long before Foiehibition, Father’s Office debuted one of their first ever desserts – the foie gras ice cream sandwich. 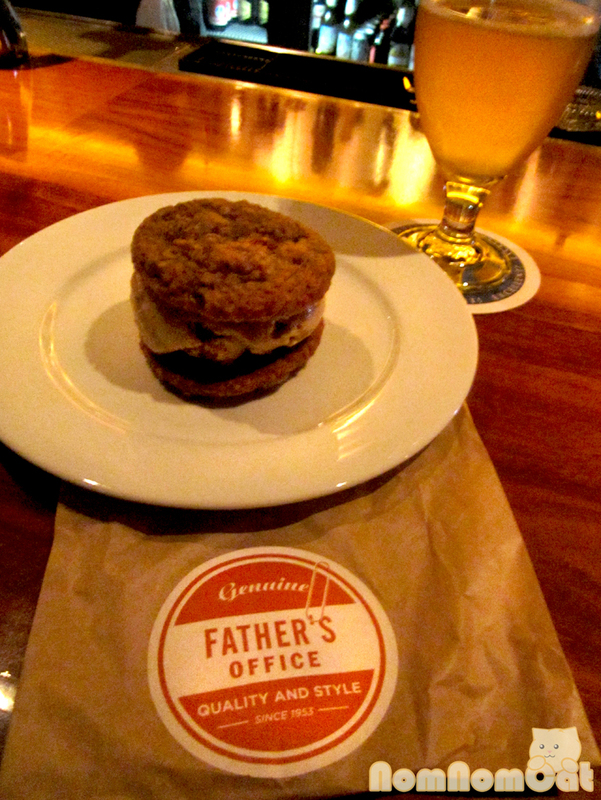 It was house-made hazelnut and foie gras ice cream smooshed between two oatmeal raisin cookies. So good. The foie gras flavor was really delicate but detectable. Unfortunately the sweetness and strong cinnamon flavor of the cookies overwhelmed it a bit. Still, the cookies were moist but substantial enough to make this handheld dessert delicious down to the very last bite. So if you’re looking to unleash your inner carnivore or perhaps celebrate a long day’s work with a cold craft beer or two, head on over to F.O. and order The Office Burger with a side of frites and a tall glass of whatever tickles your fancy (there’s even a cute fire hydrant tap for pouring water). Have your IDs out and ready (sorry kids, it’s 21+ even if you’re not drinking) and be sure to delegate: group A scopes out seating while group B gets in line and picks up the first round of the night. It helps to have a game plan.